21 Days: No Television - Oak House Design Co. I turned 34 last month. It doesn't phase me to get older, but there were changes I wanted to make before I turned 34 that weren't realized. (Well, for that matter before I turned 30, 31...sigh) At the beginning of the year I was feeling I needed a shake-up of my routine and my habits. Now here it was March, and nothing had really changed. I was actually fed up with the fact that a lot of the goals I had set for myself in the past year went largely unrealized. Yes, there is life's unpredictability, but I felt as though anything and everything could throw me off track. I think it boiled down to no longer trusting myself to keep my word to myself. Thanks to invitations by friends, the first weekend of March was active for me. So we happened to not watch any TV that weekend. Plus my husband was out of town. I was also reading several articles about time management. That night, I decided something's got to give. I got up and unplugged the TV. And I haven't watched it since. I know I'm not the first person to do this, but for me I felt TV had become a habit and a filler. I was in the habit of turning it on first thing in the morning to 'wake-up' the house. I was in the habit of watching it and having the sound when I did chores. And it had become habit to use it as a filler when I was tired or wanted a break. The most interesting thing I learned was that, for the most part, I didn't miss it. I thought it would be hard, so I unplugged the TV so that if I accidentally walked over to turn it on, it wouldn't come on. It's now been over 21 days and I think I've had three times when I felt like I really wanted to watch TV. Once on a rainy day that would have been nice to cuddle up in front of the TV. Once when I was really tired during the day and actually just needed a nap, which I took. And just this past weekend, I thought it would be nice to sit with my family and watch a movie, but we turned on music and danced instead. I almost watched TV by accident at a friend's house during a hair appointment. She handed me the remote to choose a station, but I couldn't remember the channel numbers to the stations I normally watch! And then I thought, "Oh yeah, you aren't watching TV!" Instead I picked up the book I had brought to read. Overall, I really didn't miss it. Turning off the TV was a catalyst for accomplishing so many other things! I finished at least half of my spring yard work before it was actually spring! I completed some home projects that have sat unfinished for months, and even started back exercising. One of the articles I was reading suggested making a list of tasks you want to accomplish, and breaking down larger projects into a smaller task list. For me, list making is key to getting more done in my day. In the past, I've had the idea of cutting off the TV for a month. I would run it by my husband and he wasn't such a fan. This time, I didn't tell him. But I also didn't try to force it on my family. In fact, I didn't talk to them about it at all. But surprisingly they didn't really request the TV much either. When my husband got back from out of town he asked was the TV broken, but I just told him it was unplugged. He generally watches TV shows on his tablet and I think he said once, "Is the TV still unplugged?" I wonder if he realizes how little actual cable TV he watches. With The Bub, I think he requested TV once when a friend came over. Literally, by the time I walked over to plug it in, they had run off to play something else and forgot about it. We did go see one movie in a theater this month. But, I have been really surprised at how easily he occupies himself with other things. I did also try to encourage play by putting quite a few of his toys in a basket so that he could easily see them, instead of keeping them in storage ottomans. Many of the playroom projects I am working on (that I'll be sharing soon!) have been to encourage him to play more rather than sit in front of a screen--be it TV, a tablet, or video games. I don't feel this battle has been won (he's sitting here on the tablet right now), but there is progress. TV and video games are no longer his first request many days. I picked 21 days because it's been said that it takes 21 days to change or set a habit. I still have many areas I want to progress in, but this has given me a boost of confidence in myself, that I can stick to something. 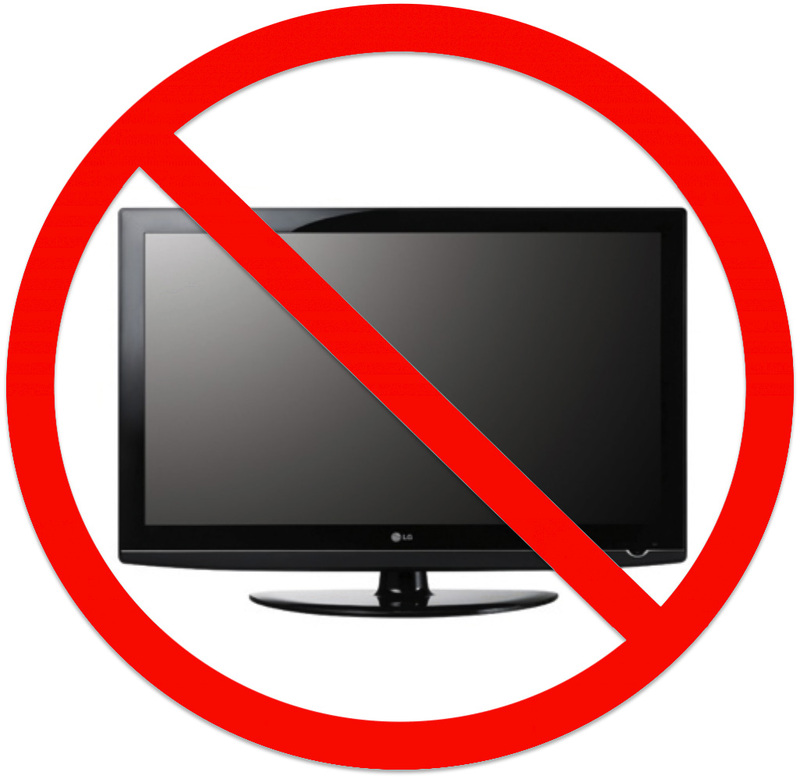 I don't think I will permanently eliminate TV, but I did realize that there wasn't anything that I really wanted to see. Most of the shows I really used to enjoy watching no longer air on TV, and I had turned to a lot of trashy reality TV to fill the void. I have been trying to figure out what next; what is the next catalyst to change. I am thinking of something health related, perhaps to eliminate soda, or maybe 21 days of real food, no processed food. For me personally, I think that will be a much harder challenge, but perhaps when I reflect back on letting go of TV, this time I will be resolved to stick to my guns. Have you ever eliminated something from your life? Was it temporary or permanent? I would love to hear your suggestions on a healthy diet change/elimination. I will be back to share another project from the Playroom Makeover. Enjoy your weekend. Well I haven't watched any television channels any part of the year but I have watched t.v, what i am saying is I call it true on demand t.v I download a season or more of something that I want to entertain me and when I have time I sit and watch and if I need to stop it I can come back ti where I left off at anytime, I feel that I now actually control television, most people are bound by times that a favorite show airs but I am not, let me ask this, could you go that long without the internet? I like that you've decided what you want to watch before turning on the TV, and watch it when you want to. I had the habit of turning on the TV and then seeing if there was something entertaining and mostly found things that were time-consuming and not really entertaining to me. Giving up the internet? I think it would be far more difficult, because there are lots of things I like to read online! I find this vey interesting because I find that TV is a huge distraction for me. Right now the TV is on and im not watching it. Im often using it as a filler just for noise or just to see what mess is on. Honestly half of the time the TV is on and no one's in the room. Out of all of the shows that come on I probably watch 3 of them. I could just imagine what I can accomplish if I just turn off the Box! Its going to be very hard but I must start somewhere. That's exactly how I felt! That would happen to us too where the TV was on but no one was watching it. In fact, sometimes I would pause a show and the TV would go into screen saver mode, and I still would just have it on! Change is hard. For any small victory, I feel I have one hundred defeats. But all we can do is keep trying. Let me know if you give it a try!